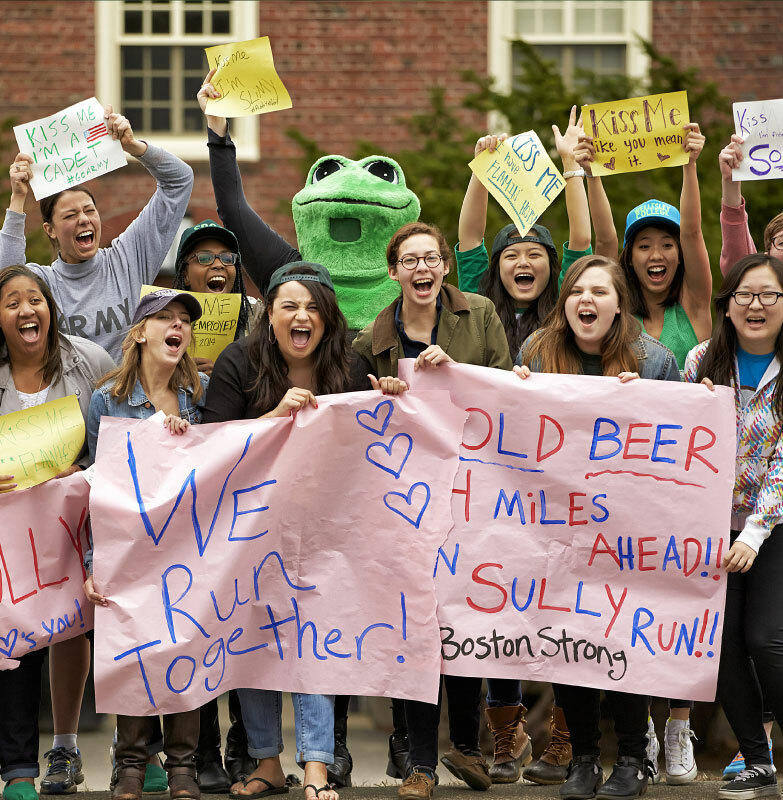 The marathon wields such transformative power that it makes even Wellesley women forget themselves. Runners hit the Scream Tunnel just short of the halfway point, on Route 16, a quarter-mile-long wall of sound spawned by 2,000 female throats and sustained for three feral hours. Nothing on campus compares. “It’s the best day of the year here,” says Molly Tyler, president of the dorm, Munger Hall, that has organized sign-painting sessions for decades. This year, sign requests from runners’ families and friends figure to spike well above 500. “This is for a friend who is doing his 13th Boston in a row, and he always takes a good 20 minutes to enjoy mile 12 to mile 13, i.e. Wellesley,” read one Facebook message posted in March. “A couple years ago, he ran that mile twice, enjoying it.” The sign request: dr. rick, kissing club member hopefuls. Translation: Along with the posters of encouragement, the Wellesley women scribble up placards with all manner of enticement, be it brainy or bawdy: kiss me, they read, i’m a feminist, or . . . i’m fertile . . . or i’m a biochemist. This being the intellectual home of Hillary Clinton and Madeline Albright, it’s disconcerting to hear that many slather on lipstick for the only time all year and compete to leave their mark on as many runners as possible. Last year, after news of the bombing reached campus, an uncharacteristic silence settled over the Scream Tunnel, and over Munger Meadow, where the all-day party usually churns. The women of the dorm ignored their looming finals, and across the following days they gathered to paint more signs. Then they took them into Boston by the dozens and hung them with all the sneakers and flowers and medals on the makeshift memorials off Boylston.